What is a calcutta auction in golf? "The term "Calcutta" describes a type of auction-pool wagering that can be applied to golf and many other sporting events. In golf, a Calcutta is most common at a tournament featuring 4-person teams, but a Calcutta can be held in conjunction with any type of golf tournament. 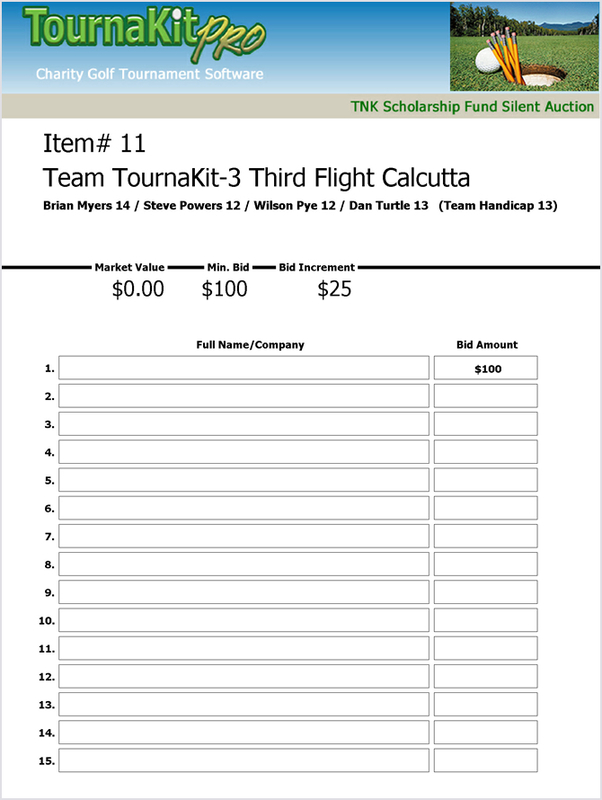 In a Calcutta, golfers bid, auction style, on the golfer or team who they think will win the tournament (you can bid on yourself or your own team, too). All the money raised through the "auction" goes into the pot. 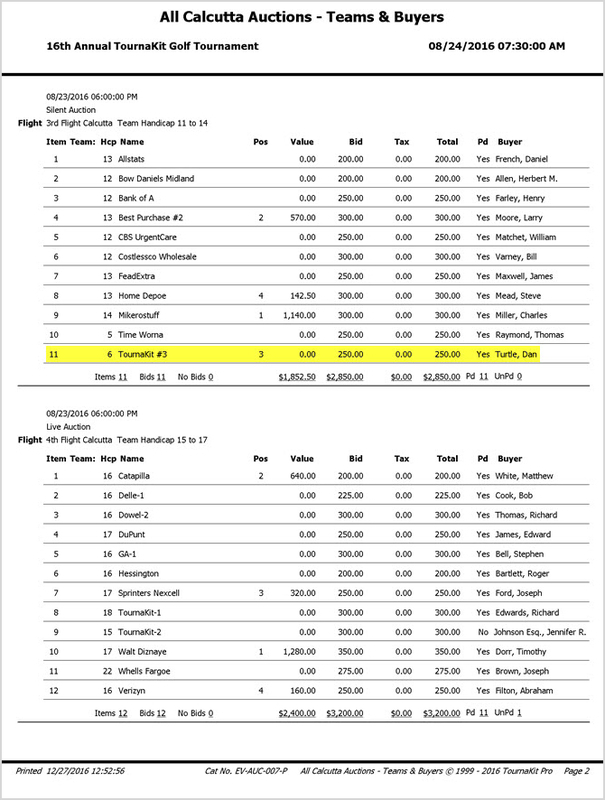 At the end of the tournament, those who "won" the team that then won the tournament get a pre-determined payout from the auction pool." Charity Golf Calcutta Auctions Create Excitement! The charity golf calcutta uses team handicaps and graduated flights to keep everyone involved in the tournament regardless of their golf skills. Charity calcutta auction participants will strategize their bidding like stock brokers buying 'futures'. 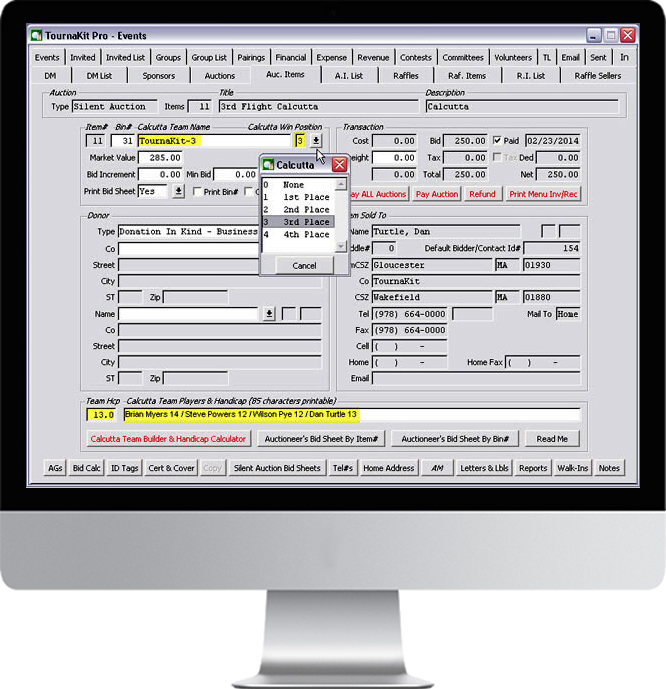 Plan calcuttas smarter and faster, it does it all so you can do more. In most charity golf tournaments teams are foursomes made up of players sponsored by a company or employer. TournaKit Pro keeps track of player handicaps and their teams. 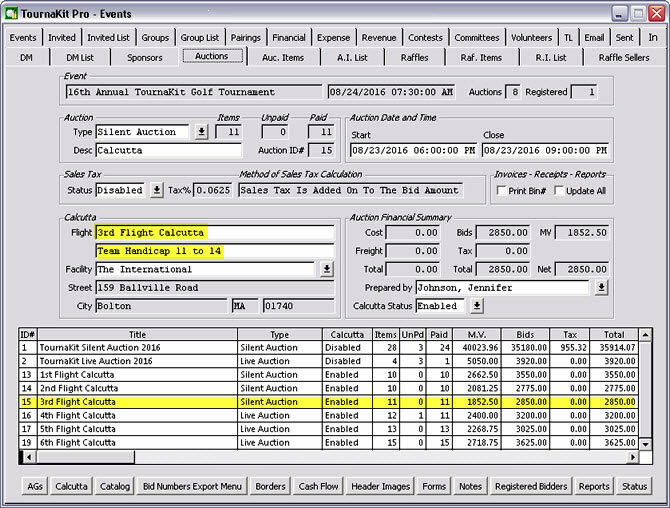 The 'Event Registration by Team Name' report provides essential quantitative data needed to flight the golf tournament and created your calcutta auctions. We will be highlighting the team 'TournaKit-3' for a focal point in our following conversation. Multiple flights provide an equal playing field. Each flight becomes a calcutta auction. Click on 'Auction Items', create new record, enter team name, team handicap, team players, save record and done! Most people using TournaKit Pro are having a scramble golf tournament. The problem is the team with the largest number of low handicap players typically win the event. The mathamatical model you choose to handicap your golf tournament teams will directly impact the outcome. 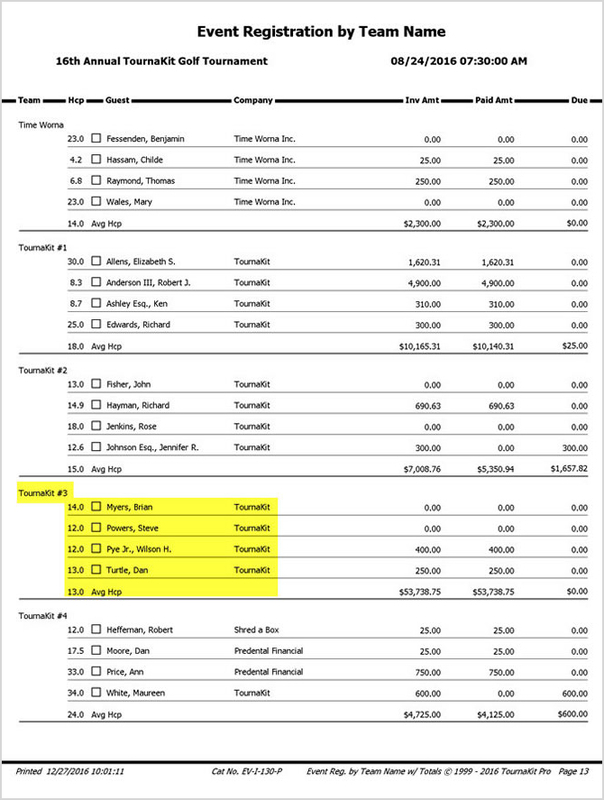 TournaKit Pro's integrated 'Team Handicap Calculator' provides five different methods to calculate team hadicaps. Below you will notice 'Team 1' has a couple of low handicap players but their Average Handicap is higher than 'Team 2' which is made up a players with similiar handicaps. 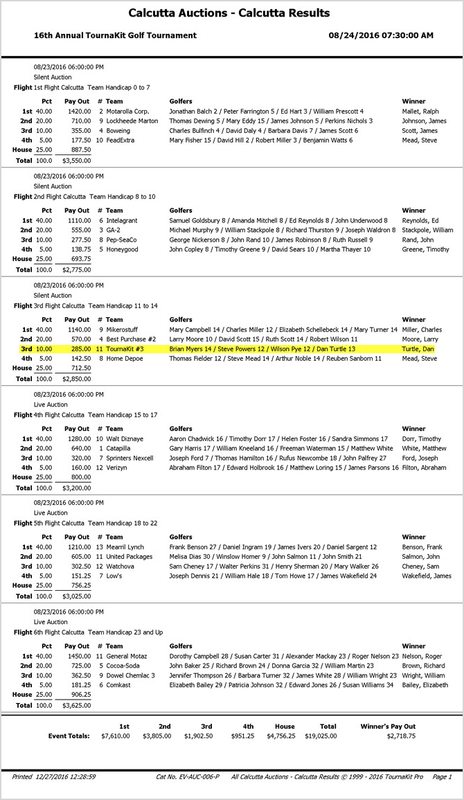 In a scramble format my money is on 'Team 1' because the low handicap players will carry the team scoring and the 14 points are more than they deserve. The 'Average Handicap' method is easy to calculate but inherently unfair. 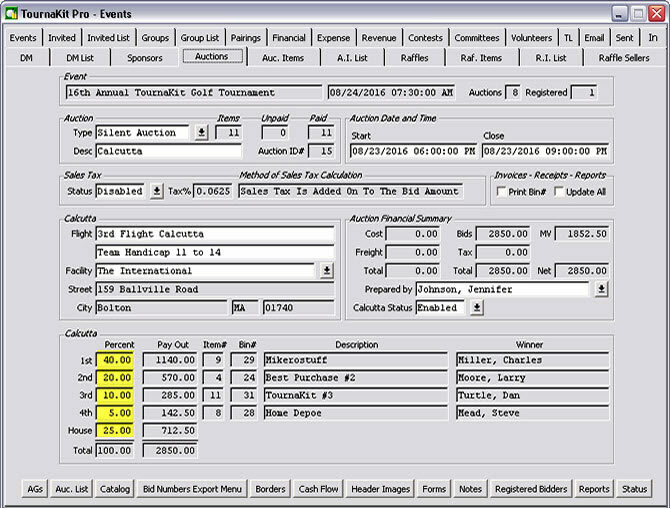 TournaKit Pro's 'Team Handicap Calculator' has five different methods to handicap golf teams (optional). A popular method to equalize foursomes is to sum a graduated percentage of the handicap based its value. By hand that is a lot math, with the TournaKit Pro it's only a click. [ 4 Players 20% 15% 10% 5% ] method. 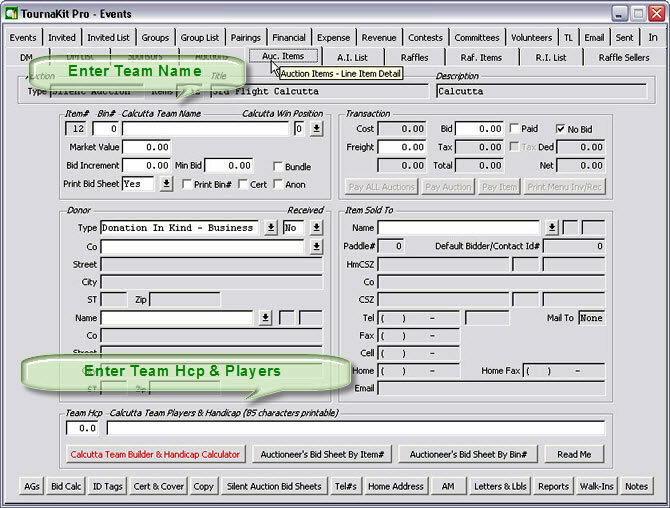 Choose a team habdicap method that best suits your event. 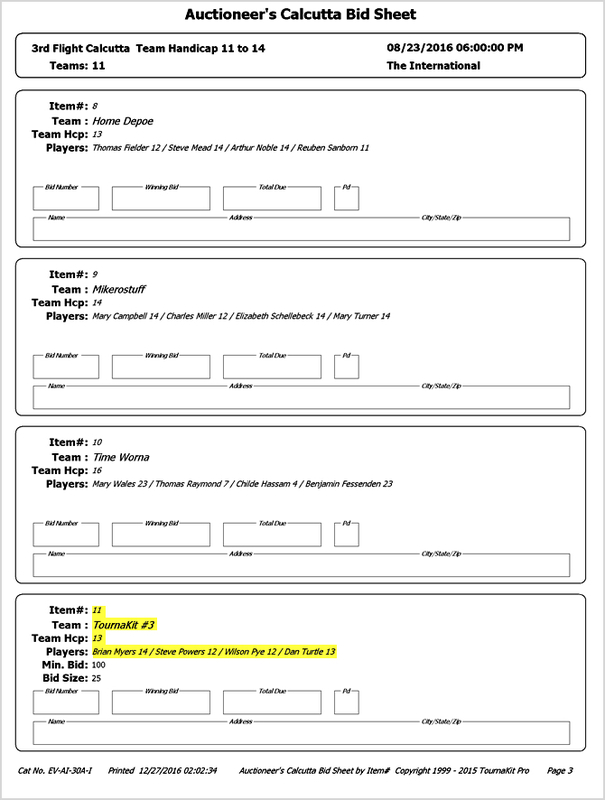 Note: Manual data entry is the default for team name, team handicap, and team players. 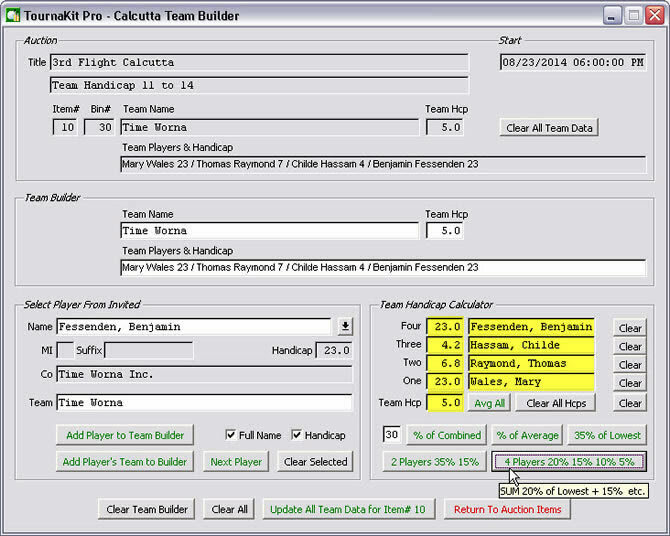 To access TournaKit Pro's 'Calcutta Team Builder & Handicap Calculator' simply click the command button on the bottom of the Auction Item screen. 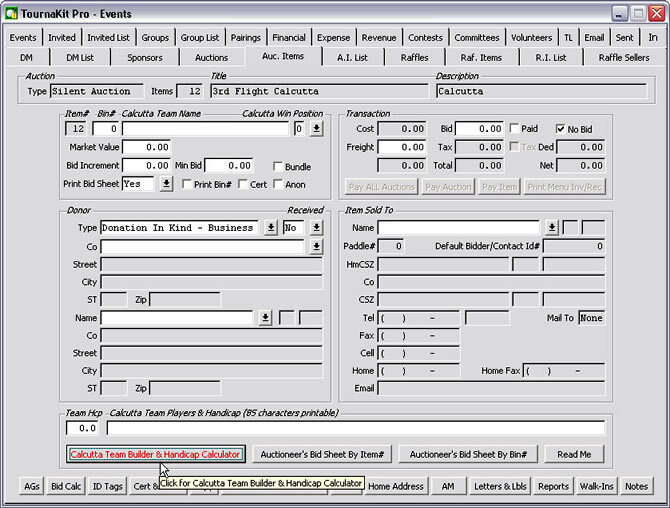 Each calcutta auction item is fully integrated with the event's financial and statistical record keeping systems. Enter the golf team's winning position and TournaKit Pro will calculate the calcutta payout. 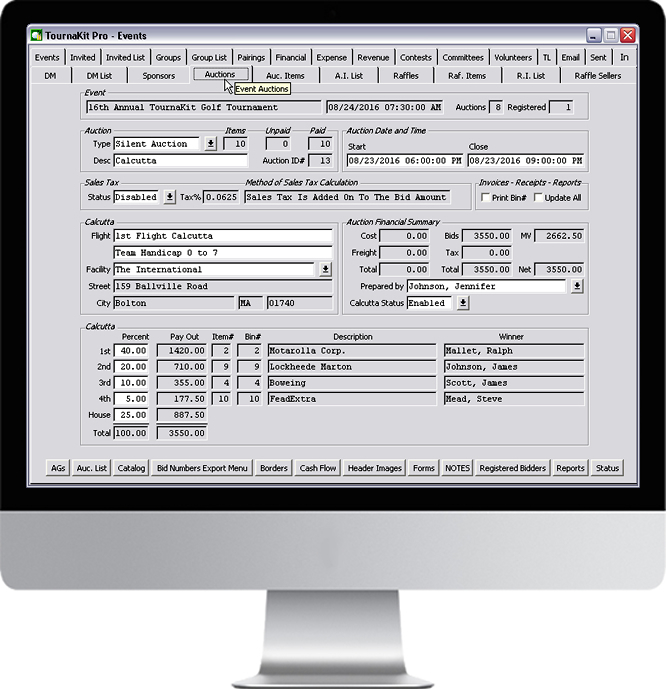 TournaKit Pro automatically calculates the calcutta payout based on your predetermined percentages of the calcutta gross revenue. The 'Calcutta Results' report will summarize all the calcutta auctions within an event. 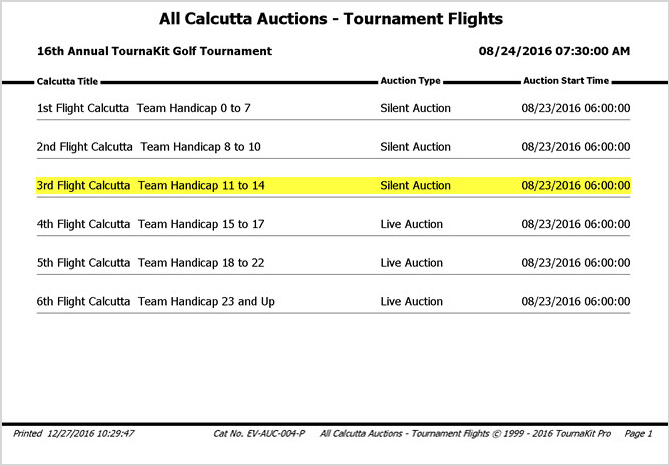 In the example below there are six calcutta auctions titled 1st Flight... through 6th Flight... 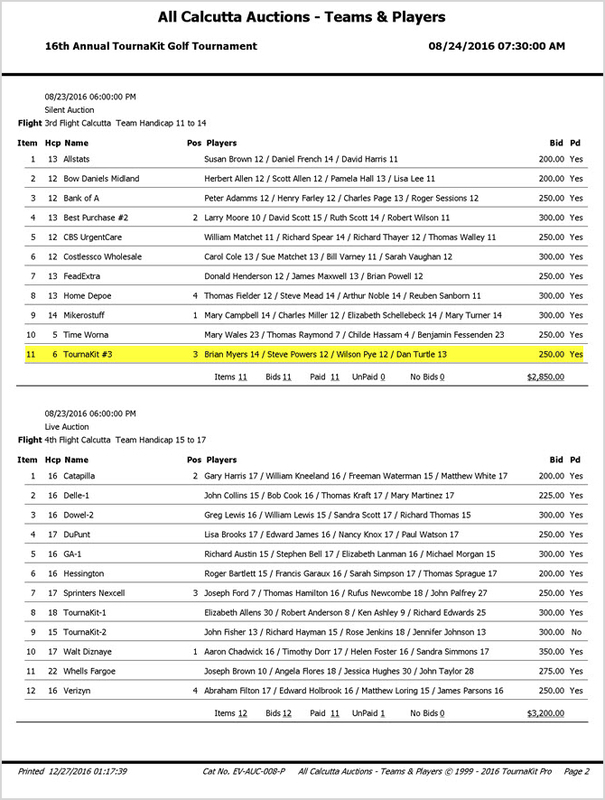 The report contains all the percentages, pay out totals, auction item numbers, tournament team winners with players, and the owner/highest bidder of the calcutta auction items. The report concludes with a summary of the event calcutta totals for winning positions, house revenue, calcutta gross revenue, and the calcutta winner's pay out. One of 108 silent auction bid sheet styles to choose from.